The grandmother of a 26-year-old father and former football star who was shot and killed outside a Cleveland bar told newsnet5.com's Frank Wiley that the grief walks with her every day. "I still talk like he's with us; he's just not in our presence," said Dorthea Garrett. 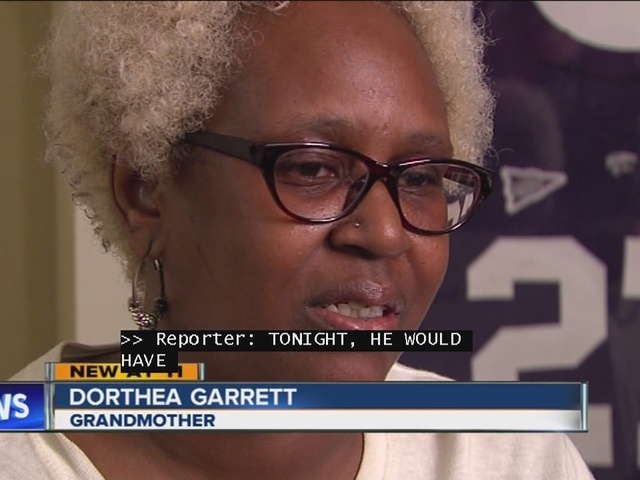 Her eldest grandson David Garrett was shot outside the Lavish Ultra Lounge in Cleveland Oct. 11, 2014. The 26-year-old, who was a football star in Painesville, was the father of a 4-year-old and worked at the Cuyahoga County Juvenile Justice Center. Family members say Garrett was planning to get married soon. One man, Barry Blevins, 30, was arrested last December and is in jail on a $1 million bond, but another suspect, Jean Blevins, remains at large. Both Barry and Jean Blevins have been charged with murder, felonious assault, manslaughter, aggravated assault, having weapons while under disability and discharges of firearm on or near prohibited premises. Barry Blevins has also been charged with tampering with evidence.